Today I have a 2nd mani using the Secret Garden stamping plates that Bundle Monster sent to me for review (see my full review HERE). Plate BM-705 has all garden themed words and is probably the plate that jumped out at me first that I wanted to use, I love all the fonts they used! It screamed for purple so I grabbed one of my all time fav grayed lavender polishes, OPI Steady as She Rose. Check it out! See, I told you the fonts were cute! 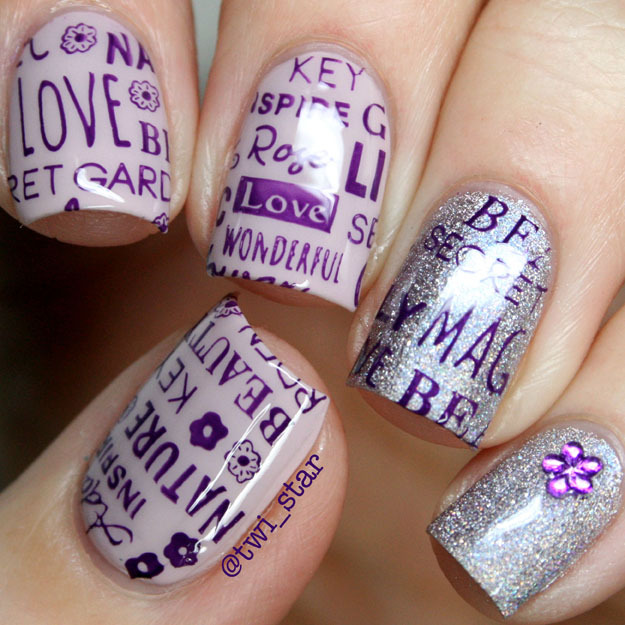 Bundle Monster plate BM-705 stamped perfectly even the very fine lines of some of the words. I used Crowley, also from Bundle Monster, for the stamping. 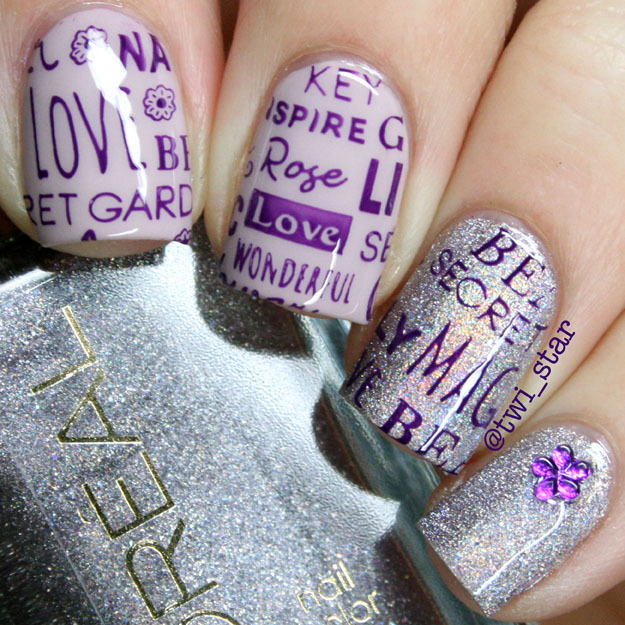 It's not sold as a stamping polish but it worked really well as one. Check out another mani I did using Crowley HERE and Steady as She Rose HERE. For the ring and pinky I chose a new cult following polish, Loreal Masked Affair. It definitely shows more holo and rainbow-y in person but my camera wasn't picking it up today. 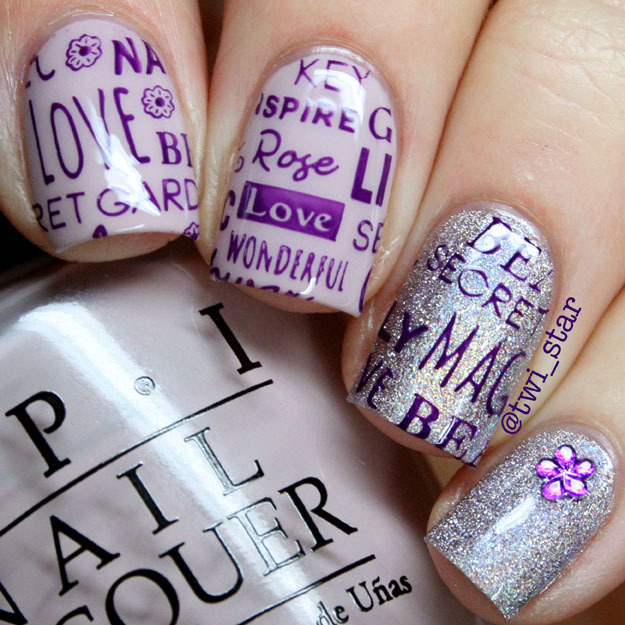 See another mani using Masked Affair HERE. Surprisingly Crowley the dark purple creme stamped better over Masked Affair! Here is a close-up of some of the stamping from Bundle Monster Plate BM-705. I added a little flower jewel that I got from ebay. 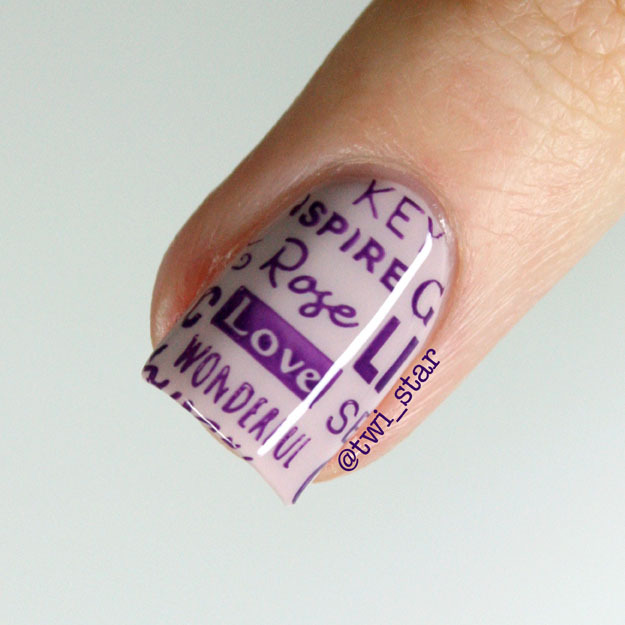 The plate is full of so many words that you can pick out ones that you want to get onto the nail easily, I knew I wanted "Love" and "Rose" so it was super easy to place them. So far I'm really loving this set of stamp plates from Bundle Monster! Thanks for checking out my work!